Often, when we decide to follow a specific diet, we do not think about how it will affect our hormones. Many people choose fast weight loss, but this can play a bad joke on their body. The body does not like rapid changes and strives to maintain a relatively constant environment. A great contribution to this environment lies in a number of body mechanisms, some of which are the hormones leptin and ghrelin. Can we influence them and how we can do so ? Our body has the function to regulate and maintain the homeostasis in a stable and constant state for a long period of time, in its internal environment. When it comes to weight, the body has a set of hormonal mechanisms that influence appetite and energy balance, and it tends to keep them in relatively constant borders. If you think about it, there are people who manage to maintain the same weight for years. This means that the absorbed energy is equal to the expended. To gain or lose weight, one must accordingly increase or decrease their energy intake. However, this has an impact on hormone levels, and if we lose weight too fast, it will cause the body to react with compensatory mechanisms and can lead to sharp fluctuations in hormone levels that are often undesirable. The main hormones that play an important role in the regulation of food intake and body weight are leptin and ghrelin. Leptin and ghrelin are hormones which are secreted in different parts of the body, but communicate with the brain through the hypothalamus. Hormones are a small part of the endocrine system – the largest network that unites separate glands throughout the body. Each of the glands is related to the others, and they are all related together to the brain, nervous and immune system. The hypothalamus is a gland of this system, which carries important connections and interactions of hormones. It also processes and provides data about the internal state of the body. Receptors of leptin and ghrelin in the hypothalamus provide the brain the knowledge of the energy balance in the body. Leptin and ghrelin have the opposite effect: leptin reduces hunger (ie gives signals to the brain that we are full) and ghrelin increases hunger. Leptin is released by fat cells into the circulating system. It travels its way to the hypothalamus and allows the brain to receive signals about the state of energy stores and satiety. How it reaches the brain? Briefly, the process is as follows: leptin is released from adipose tissue into the bloodstream. It crosses the blood-brain barrier and binds to the leptin receptors in the hypothalamus. There, it transmits the necessary information about the state of energy stores in the body. How it affects energy balance and food intake? Leptin has influence on the activity of several hypothalamic neurons, and respectively – the formation of anorexigenic and orexigenic neuropeptides. These are neurotransmitters involved in the regulation of appetite – orexigenic neuropeptides increase appetite while anorexigenic reduce it. This hormone has an influence on various biological mechanisms, including reproduction, the immune response drive, hematopoiesis (process of blood cell formation), angiogenesis (formation of new blood vessels), bone formation, wound healing etc. Low levels of leptin lead to hunger. There are studies that suggest that obesity is related to leptin – people that are overweight may have leptin resistance. It is believed that it is the result of systematic and long overeating. – You are eating too many calories and accumulate body fat. – More body fat – more leptin in fat cells. – The hypothalamus is exposed to high leptin levels, which can disrupt the signals to the brain. It becomes less sensitive to leptin. – The brain thinks that the hypothalamus signals hunger and causes the body to feel hungry. – You become increasingly thicker and more hungry. Ghrelin is mainly secreted by the stomach, but ghrelin has been identified in other peripheral tissues as well – the gastrointestinal tract, pancreas, ovaries, adrenal cortex. Ghrelin secretion is dependent on nutritional status – when the stomach is empty. There are suggestions of three different pathways by which ghrelin transmits signals to the brain and causes hunger. – After the release from the stomach into the bloodstream ghrelin can cross the blood-brain barrier and bind to the corresponding receptors in the hypothalamus. – Ghrelin can reach the brain via the vagus nerve and the terminal nucleus of the medulla. – Ghrelin is produced locally in the hypothalamus, and directly influences the various centers in the gland. How does it affect energy balance and food intake? Ghrelin is a short-term regulator of body weight – when levels are high, we are hungry, and this is happening right before eating. When you eat, its levels fall. If your goal is weight loss, it means you need lower levels of ghrelin. If you want to increase your weight, ghrelin must be sufficient to have the appetite to want to eat more. Can we influence the leptin and ghrelin levels through diet? 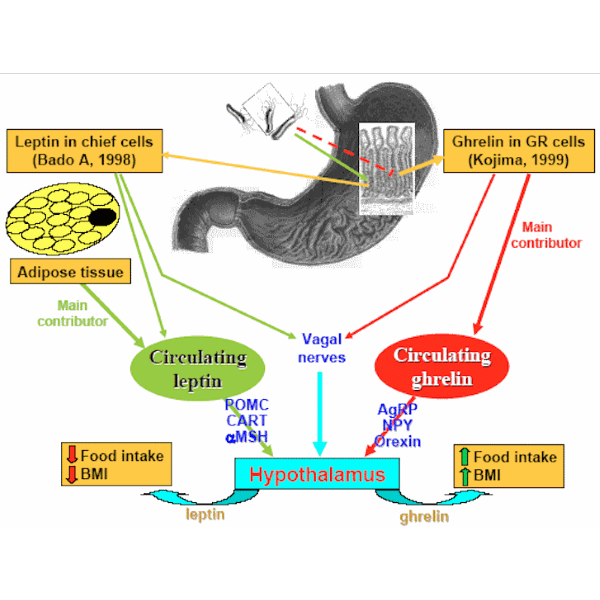 Food intake has significant effects on circulating levels of leptin and ghrelin. Eating increases leptin production in healthy people. On the other hand fasting causes almost double increase in plasma ghrelin levels before each meal. Not only the size and frequency of the meals have an effect on circulating levels of leptin and ghrelin, but also the meal composition plays a role. Both leptin and ghrelin play major roles in controlling the energy balance system. Leptin is involved in long-term regulation and ghrelin in the short term regulation. In contrast to leptin, ghrelin did not seem to be critical for normal appetite and growth. Although the systems of these two hormones act alone, their performance (while maintaining energy homeostasis) includes several overlapping paths. There are studies that suggest that the hormonal mechanisms controlling appetite, can be different for men and women. This difference comes from the difference in hormonal setup. – Ghrelin is affected by the release of growth hormone, but it is different in men and women. Leptin influences the reproductive capacity of women, which is related to levels of body fat. Women are more sensitive to leptin, than men. There are a lot of questions, and some of them have not yet been answered. We need more research on how hormones interact on various factors, because they correspond with each other through a complex system. On thing is certain though – short and intense diets do not lead to long-term success. Therefore, when you intentionally want to change body homeostasis, do it slowly in order not to get the yo-yo effect. What else can we do except pay attention to our diet to maintain normal levels of leptin and ghrelin? It is believed that fish oil (omega-3) and regular sleep have a role in the improvement of leptin and ghrelin levels. – Omega-3 fatty acids are associated with a decrease in hunger. – Lack of sleep leads to higher levels of ghrelin (we are hungry) and lower leptin levels (we are not full), and furthermore it disturbs the glucose metabolism and insulin. – Do not forget regular exercise, tailored to your individual goals and abilities.